Approximately six people pass away from alcohol poisoning daily in the United States. Some people cannot stop drinking after only one or two drinks. At least not all the time. Whether it’s an innocent bet they want to win, or they’re feeling stressed out, one drink shortly becomes one too many before they realize. Alcohol poisoning is more frequent than you might think. You should learn the signs of alcohol poisoning and what to do if a friend or a loved one exhibits these symptoms. Someone who has drunk too much may not be capable of getting help for themselves, especially when speaking about teen drinking, so your efforts can ultimately save a life. What are the Effects of Alcohol Poisoning? How Many Drinks Cause Ethanol Poisoning? How Should You Act If You See Signs Of Alcohol Intoxication? An individual can suffer from acute alcohol poisoning if she or he consumes a toxic amount of alcohol in a short time. Alcohol poisoning is drinking to a deadly level. An individual drinks large amounts of booze within a short time. His or her liver is not able to metabolize the ethanol and filter it out. Alcohol and liver have a deep link as the liver is are the most affected organ by ethanol. The non metabolized ethanol enters the bloodstream. The Blood Alcohol Concentration (BAC) rises. When the BAC gets to a toxic level, the mental and physiological functions are severely affected. Alcohol poisoning can be life-threatening, and it demands swift medical attention as the hangover is not the worst thing that can happen after alcohol overdose. The usual symptoms of alcohol poisoning include seizures, vomiting, hypothermia or low body temperature, an uneven breathing pattern, and a slow way of breathing, which usually means less than eight breaths per minute. Furthermore, you should watch out for mental confusion, loss of motor coordination, pale skin, and stupor which means being conscious but unresponsive to stimuli such as touching. Hide all alcoholic beverages in the person’s vicinity as you wait for medical aid to arrive. Your swift actions can stave off the beginning of the life-threatening effects of alcohol poisoning. Hypoglycemia: Blood sugar levels can drop to a dangerously low level because of vomiting. This determines the onset of a condition called hypoglycemia. If the person suffering from hypoglycemia does not get glucose promptly, he or she can enter a coma and might even die. Choking: Booze irritates the stomach and makes the person sick, which leads to vomiting. A passed out individual might choke on his or her vomit. Dehydration: Vomiting can determine severe dehydration that can quicken the heart rate and decrease blood pressure. Cardiac Arrest: A low body temperature associated with a lowered blood pressure can determine a cardiac arrest. Kindling: The withdrawal symptoms will increase each time one drinks – this is what kindling is. Stoppage of Breathing: Accidentally inhaling vomit inside the lungs can lead to a stoppage of breath. Brain Damage: Hypoglycemia, cardiac arrest, and irregular breathing can determine irreversible brain damage. 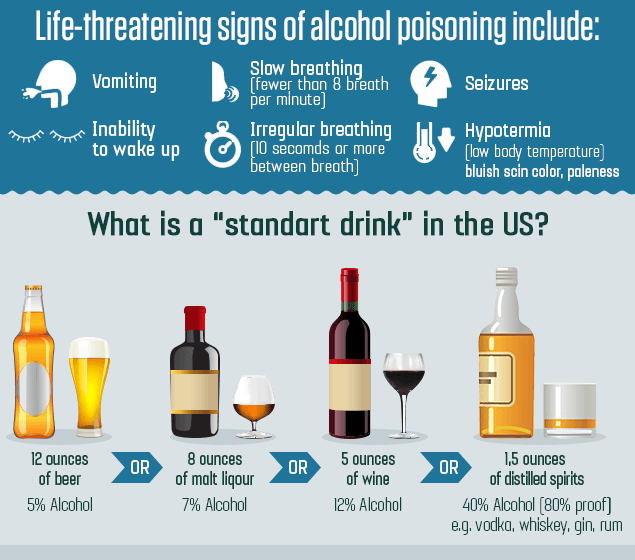 You’re probably wondering – Can you die from alcohol poisoning? – Unfortunately, the answer is yes. Alcohol poisoning death is more frequent than one may think. Everyone should be able to identify the intoxication and the symptoms it produces to keep your loved ones safe. Usually, men can display the effects of alcohol poisoning after five or more drinks, while women display them after four or more if the drinking takes place over atwo hours. Drinking this quickly is called binge drinking, and it is the most frequent cause of ethanol poisoning. Binge drinking raises the BAC to life-threatening proportions. Binge drinking can elevate the BAC to 0.08 percent, a level that determines increased mental and physical impairment. A BAC level of 0.31-0.45 percent is regarded as life-threatening. Even so, there is no standard limit for alcoholic drinks that will cause the intoxication. Every individual reacts differently to alcohol. A person can suffer from alcohol poisoning even if she or he does not consume a large amount of ethanol. Height And Body Weight: Those who are larger and have more muscle or fat mass in their bodies absorb less ethanol into their blood. Liver’s Metabolism Rate: Your liver metabolism rate determines how quickly your body can break down ethanol and how certain enzymes create the individual genetic makeup. The allergy to alcohol will increase the symptoms of poisoning. Full or Empty Stomach: Food decreases the absorption of ethanol into the bloodstream. 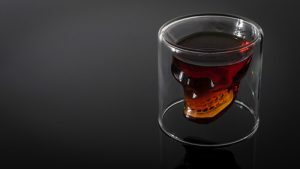 Drink’s Ethanol Concentration: If a drink has a higher ethanol concentration (for example, distilled alcoholic beverages contain more ethanol than fermented drinks), more ethanol will eventually reach the bloodstream. Other Drugs Are Present In The Body: Drugs like cocaine, heroin, and prescription medication like opioid painkillers and sedatives enhance the toxic effects of ethanol. Alcohol Tolerance: Chronic alcohol users have a built-in tolerance to the repercussions of high BAC levels. How Should You Act If You See Signs Of Alcohol Poisoning? Give them more alcohol. This will only increase their BAC further. Make them drink coffee. Coffee only aggravates the dehydration. Extreme dehydration might cause lasting brain damage. Make them walk around. An individual who drank too much booze might not have control over their motor capacities. They might lose their balance, collapse, and sustain lesions. Make them vomit. An excessive amount of ethanol in the body reduces the gag reflex. Making them vomit might determine them to choke on their own vomit. Make them lie down. If the person is awake, do not force them to lie down. If they vomit, they risk choking in a prone position. Give them a cold shower. Ethanol lowers the body temperature. A cold shower increases the risk of hypothermia. Leave them alone. The BAC levels rise as the body absorbs more ethanol from the stomach and intestine into the bloodstream. This process occurs even if the individual stops drinking. Therefore, new symptoms can appear and the existing ones can become worse; you need to be alert. As you watch over the intoxicated person, DO the following to keep them comfortable, safe, and manage their symptoms . 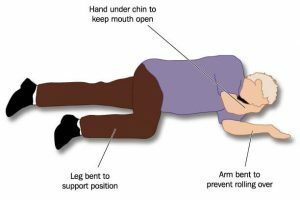 If they are unconscious, put them in the recovery position. Turn their head gently on one side to prevent them from choking. If they are awake, make them sit upright. Keeping them upright will prevent choking if they vomit. Keep them awake. Keep them awake by talking and try to prevent them from losing consciousness. Keep them warm. Check their body temperature and make sure it does not fall further. Give them water, if they are able to swallow. Water can stave off dehydration and helps the body to flush out the toxins. Even so, make sure that the individual is sitting when they swallow the water and they are unlikely to choke on it. Keep watch over them until medical assistance arrives. Keep watch over the person and be alert to prevent them from accidentally injuring themselves. You should also be aware of delirium tremens symptoms as the person might be dangerous in such condition. Naturally, the first step you should do is to call for medical assistance, even if you know how to treat alcohol poisoning. Call 911. Stomach Pumping: This procedure is done in an attempt to eliminate the unmetabolized ethanol from the stomach. The specialists pass fluids through a tube attached to the mouth or nose to pump the stomach and to ease alcohol withdrawal symptoms. Catheterization: A thin tube called a catheter may be attached to the bladder in an attempt to drain urine directly into an attached bag. This medical procedure keeps the individual dry. Intravenous Administration: The intoxicated person might need to be administered glucose, water, and vitamins to provide the proper nutrition to the body and keep his vital signs stable. Intubation: Sometimes, specialists insert a tube into the windpipe through the mouth in an attempt to remove any blockages that might partially or totally restrict the patient’s airway to help them breathe. Dialysis: In some intoxication cases, kidney dialysis is necessary to quicken the body’s toxin removal as alcohol is bad for kidneys. An individual who has been consuming alcoholic beverages for a while may not realize that booze is taking over their body and mind. The BAC does not need too many drinks to reach toxic highs. Learn more about the signs of acute alcohol intoxication, especially if a loved one or a friend has an inclination to binge drink or had the incidents of alcohol relapse. The treatment for alcoholism may be necessary if such incidents occur often. Luckily, there are many alcohol rehab centers available to provide the professional assistance in the recovery process.